Buy 2 BlackBerry PlayBooks and get 1 Free | BlackBerry Blast! If any company is in need of a boost right now it is Research in Motion. 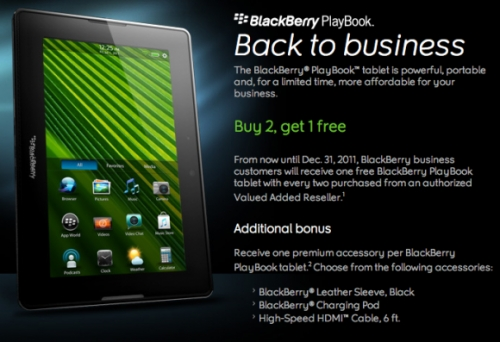 The BlackBerry maker is struggling to get people to buy their tablet and are now offering a buy 2 get one free sale. �From now until Dec. 31, 2011, BlackBerry business customers will receive one free BlackBerry PlayBook tablet with every two purchased from an authorized Valued Added Reseller,� is the offer on the BlackBerry PlayBook business site." The offer also includes a free accessory for each PB. You can choose from a leather sleeve, a charging pod or a high-speed HDMI cable. Unfortunately, the offer is not allowed for retail outlets like Best Buy, but only at value added resellers and business channels.